After our incredible dinner at EBO Restaurant and relaxing stay at the Delta Burnaby Hotel, the next morning we were treated to a scrumptious breakfast thanks to Executive Chef Daniel Craig and his wife Shanna. Still feeling full from the previous evening meal, we decided not to indulge in the decadent brunch spread and instead opted to order off the regular breakfast menu. EBO Restaurant’s breakfast menu offers standard morning favourites such as steak & eggs, pancakes and waffles, continental breakfasts alongside healthier starts to the day like egg white omelets and fresh fruit with flax seed oatmeal. EBO’s motto is “Our Kitchen Is Your Kitchen”, so should customers wish items not found on their menu, they can speak with their server and kitchen will do their best to accommodate the requests. Orange juice and non-stop coffee were a plenty, while mini jam jars were patiently waiting to be topped on toast. I ordered a traditional and comforting bacon ‘n’ eggs breakfast called the Delta Canadian Classic which included two free range organic eggs any style, with hashbrowns garnished with scallions, four pieces of crispy smoked bacon (or three pieces Gelderman Farms pork sausage or four pieces of black forest ham), served with mulitgrain toast and fruit preserves. 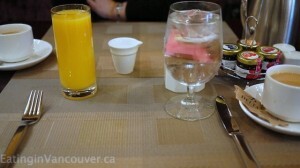 Beverages were included with this particular breakfast: A choice of coffee or tea and a selection of fruit juices. The portion size was very generous and my meal was served exactly to my specifications–extra crispy bacon and fried eggs cooked over hard. 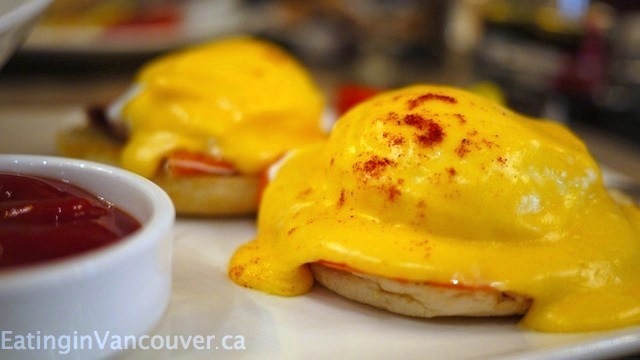 My hungry hubby chose the Eggs Benedict which included a choice of a traditional benedict with Canadian back bacon, or smoked salmon bennedict. 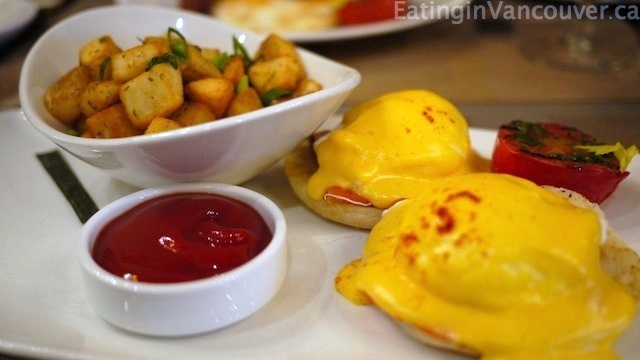 He opted for the salmon benny, and it was topped with two perfectly cooked soft poached free range organic eggs and golden hollandaise sauce on a toasted English muffin, and served with crispy breakfast potatoes. We both appreciated the grilled tomato on the side topped with delicious pesto and a delicate celery leaf. 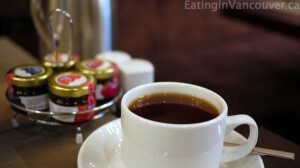 EBO Restaurant serves breakfast on weekdays from 6:30am until 11:00am, and holidays & weekends from 7:00am to 11:00am. 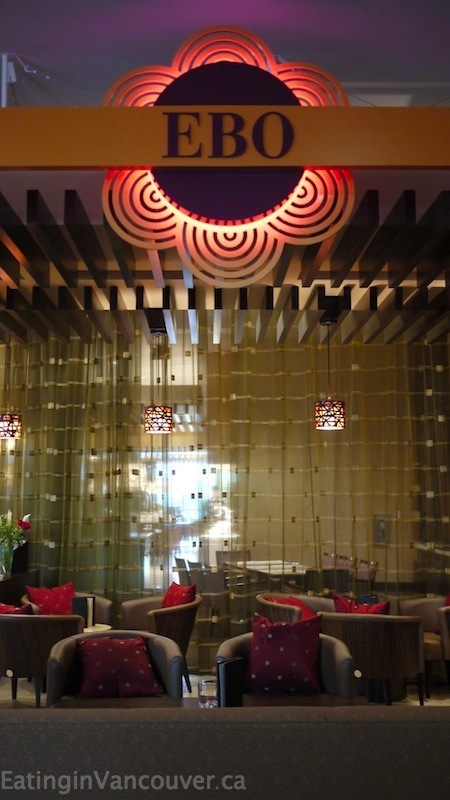 We’re looking forward to returning to indulged in their famous Sunday Brunch, offered between 11:00am to 2:00pm. 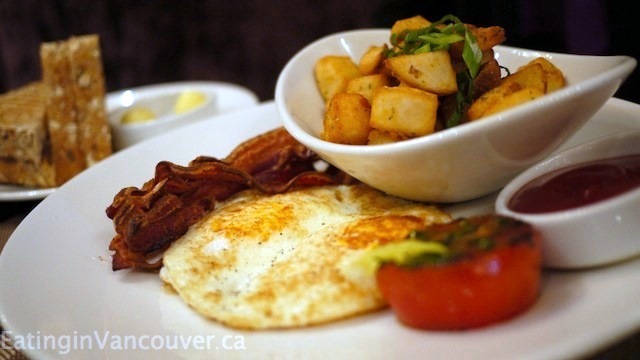 If you’re staying at the Delta Burnaby Hotel or are planning a day trying your luck at the Casino, then definitely stop by EBO Restaurant for some fantastic eats!